Christmas is an especially big deal in Molly’s town, where the citizens decorate extravagantly each year—including the tremendous amount of sparkling lights that go up each year. Something is different about the lights this year, and they’re having a terrifying effect on the children in town. First of all, how have I gone so long without reading historical romance, when historical fiction was one of my all time favorite genres as a teen?! This was absolutely delightful; I love stories that take place in the Victorian era and this is one of the best portrayals of that setting I’ve seen yet. 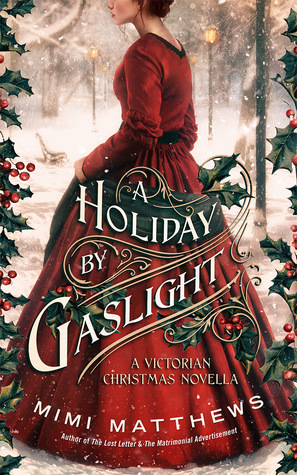 On top of that, A Holiday By Gaslight is everything a Christmas love story should be: cozy, sweet, warm, and charming. She’d been ready to love him. It would have taken so little encouragement. A fond glance. A kind word. An affectionate touch. There are so many different things I loved about this story, but we’ll start with the characters. Despite the timeframe, Sophie is a very headstrong, clever young woman who will keep her family safe and happy at all costs, even if it means losing her own happiness. What I loved about her character was not only her boldness, but Edward’s reaction to it. Instead of scolding her or trying to box her in, he sees her as an equal and cherishes her brazen remarks and stubborn nature. “I admired her. A great deal.” The understatement of a lifetime. Edward, on the other hand, is such a precious, soft little thing and I loved it. He puts on a stoic front because he feels he’ll never fit into the politically lofty world of Sophie and her family, but he’s smitten with her from the start, and it was refreshing to see that in a historical setting. I loved that, at the end of the day, Edward didn’t care about what anyone thought as long as Sophie was happy and taken care of. Even when he wants to protect and take care of her, it’s never from an “alpha” stance—he simply wants to see her thrive. It was quite probably one of the most mature, genuine portrayals of truly loving someone as an equal partner that I have read in a long time. Had she really believed he’d deny her? If so, she’d vastly underrated her charms. Either that or vastly overrated his strength of will. Finally, the writing and setting are just delightful. This is the perfect Christmas read because it’s so atmospheric with the snow, and the search for the perfect tree and mistletoe, and the party atmosphere as a whole. The writing is tender and sweet and funny enough that, despite this being such a short book, I have countless highlights saved on my Kindle! If I could recommend you to pick up any cozy Christmas read this year, A Holiday By Gaslight would easily be at the top of the list. I am so happy to have read it and can’t wait to pick up more of Mimi Matthews’ books! Kate, a workaholic lawyer, has three weeks to get a haunted bed and breakfast appraised and sold. The uncooperative manager claims a spirit who lives there will not approve. With Kate’s possible promotion resting on accomplishing this task, she checks in and haggles with the aforesaid Christmas spirit, who suspiciously seems awfully solid for a ghost. A few days ago, I asked my Twitter friends for Christmas romance film recommendations I could find on Netflix, and this was easily the most recommended one! Plus, it’s a ghost/living person romance, and I’m SUCH a sucker for that pairing, so I knew I had to check it out. My initial reaction was honestly that the acting and dialogue were… not great. I struggled with the leading guy’s accent constantly changing in subtle ways, and his line delivery was often a little stilted, while the leading actress’s lines sometimes came across overly dramatic and a bit much. If you’ve ever watched a typical Hallmark Christmas special, I’ll just say that this was very reminiscent of my Christmas romance marathons with my mom as a kid. All of that aside, though, The Spirit of Christmas was a really fun, sweet story that was pretty easy to lose myself in. The setting is beautiful and the Christmas vibe is strong, which is a basic requirement for me when it comes to Christmas romances—if it feels like it could have easily taken place at any other time of year, it isn’t the same! I also really loved the ending (no spoilers) and definitely had a few out-loud “awwww!” moments. All in all, The Spirit of Christmas will probably never win any major awards or leave its mark on the maps of time, but it’s a very fun watch that I wholeheartedly recommend checking out if the plot interests you and you’re looking for a sweet Christmas flick. Do you have any other Christmas romance recommendations for me—books or films? Let me know in the comments! It’s really hard to find holiday historical romances, the Victorian era is one of my favourite time periods to read about. I need to pick this up! I NEED this book! Wow!! I fell in love with “The Christmas Shoes” years ago. It’s a tear-jerker. It was such a good read! I hope you get the chance to pick it up! That book sounds SO GOOD. Also I watched The Christmas Spirit earlier this year (like, during the middle of the year, I think?) because that actor is gorgeous. LMAO. It was cute. I love Lifetime/Hallmark movies like that.